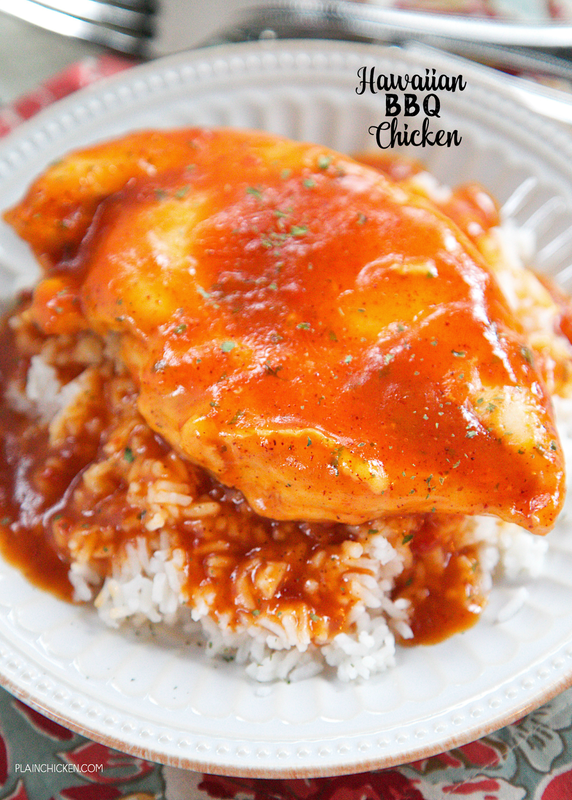 Hawaiian BBQ Chicken - chicken breasts baked in a quick pineapple bbq sauce. Pineapple sauce, ketchup, soy sauce, Worcestershire, vinegar, chili powder, and cornstarch. Bring to a boil and pour over the chicken then bake. No prep work! Super easy and quick recipe! 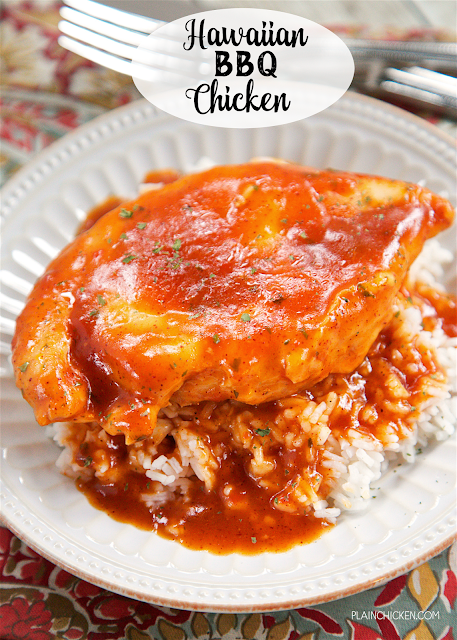 Serve over rice or noodles - make sure to pour the extra bbq sauce over the chicken - it is SOOOO good! We could not stop eating this! This Hawaiian BBQ Chicken is crazy good and super easy to make - just throw the chicken in the pan, and pour a quick homemade bbq sauce on top and bake. The sauce takes less than 5 minutes to whip up. Pineapple sauce, ketchup, soy sauce, Worcestershire, vinegar, chili powder, and cornstarch. Bring to a boil and pour over the chicken and bake. SO easy! It is ready before the oven preheats. I love quick, no-prep recipes! 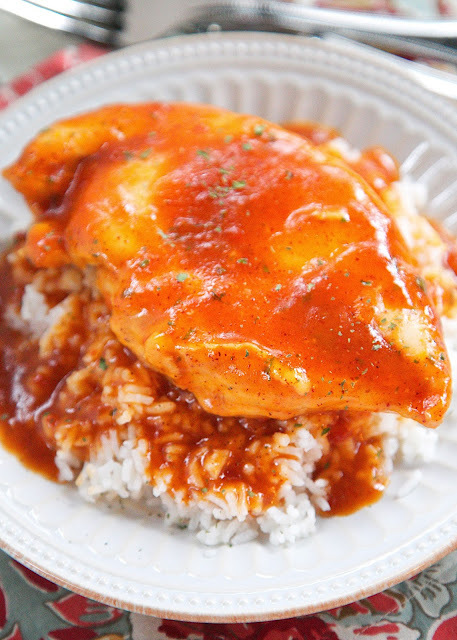 Serve the chicken over rice or noodles. Make sure to pour the sauce left in the pan over the chicken and rice/noodles. It is SOOOO good. We couldn't get enough of this quick and easy recipe! Place chicken in a lightly greased 9x13-inch pan. Set aside. Whisk together remaining ingredients in a medium saucepan. Bring to a boil over medium-high heat and boil for 1 minute. Pour sauce over chicken. Cover and bake for 40 minutes. Serve over cooked rice or egg noodles. Perfect for a busy weeknight. That sauce sounds incredible!! Oh my goodness! I LITERALLY just licked my plate after eating this delicious chicken. We did as suggested and served over rice. The chili powder gives a slight kick. It is going in our dinner rotation it's so good! The sauce is CRAZY good! SO glad to hear you enjoyed it! Add a small can of pineapple tidbits. Yummy! I don't know what I did but did just as you said 350 covered for 40 and it was FAR from done. One question, the butter says 1/4 butter, what measurement, tablespoon, cup stick... it sounds delicious but I don't know how much butter to add. 1/4 cup of butter. I corrected the ingredients. Thanks! Enjoy! !